You'll want to be #Gideonized, for sure. Gideon Hermosa is no stranger to bringing fairytale weddings to life as evidenced by his impressive reportoire—just taking a scroll through his Instagram feed alone is enough to fill your "pegs" folder to the brim. Below, we list eight memorable and gorgeous Gideon Hermosa-styled weddings to spark up your event planning, be it for a wedding or any other grand celebration. This Wes Anderson-themed wedding caught our eye when photos of the whimsically designed event made rounds on our timelines a few months ago. Just looking at the floral arrangements, table set-up, and overall dreamy aesthetic of Maika Cruz and Jeian de Jesus’ Grand Budapest Hotel-themed reception and we already knew that Gideon Hermosa had to have had a hand in it. The events stylist captured the movie’s quirky yet enigmatic aura through the use of the film’s dominant color palette, lighting the pastel decorated venue in dark shades of purple and blue. He also made sure to add in a few nods to the famous autuer’s other films such as the palm trees, present in Wes’ Darjeeling Limited, lining each side of the room. For a candy-coated cloudy dream wedding aesthetic, try a pastel theme and decorate your ceremony and/or reception with soft hues. An understated monochromatic floral setup will especially bring out a delicate vibe for a love careful and gentle in its ways. Okay, so maybe Christmas was just a few weeks ago, but it’s never a bad thing to plan your wedding this early on especially if you’re aiming for a date close to the holidays. We loved Gideon’s white floral arrangement and the red, green, and gold dinner table decor, making for a faux snowy Christmas aesthetic. But the true standout of this great Noel wedding were definitely the string of yellow lights and glass candle setup that offered an intimate vibe for the couple and their guests. Nothing screams tropical garden wedding like stylist Kim Yap and Jarvis Sy’s nuptials. Gideon clearly went all out for this one as he rendered the Santuario de San José Parish and the Marriot Hotel Grand Ballroom almost unrecognizable. The events stylist gave the bride a walk to remember with the lush greenery flanking the church’s aisle, and continued their dream secret garden wedding with the spectacular floral display at the couple’s wedding reception. You have to see the exuberant purple and pink center pieces, the lavishly designed entranceway, and the elaborate flowers drowning out the exterior of the baronial chandeliers hanging from the ballroom’s ceiling. Suffice to say, the entire affair made our jaws drop. Another wedding idea for the books is to base your venue’s decor off the Pantone color of the year like this Ultraviolet-themed reception from last year. We’re thinking a tastefully designed living coral seaside wedding would definitely win you some points on the ‘gram. Plus, you’ll always have a distinct color to remind you of your special day. 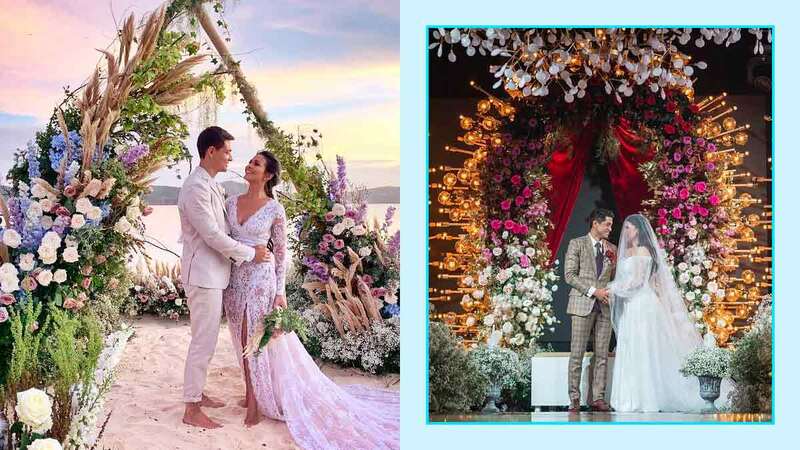 Speaking of seaside weddings, we’re still not over Ben Wintle and Iza Calzado’s beach wedding at Club Paradise in Palawan. Go boho-chic by the beach with a lush floral path to accompany your walk down the makeshift sandy aisle. You can keep the setup to a minimum with polished wooden benches, and leave the majestic ocean views to do all the talking. Going for dark and dramatic? Draw inspiration from Kylie Padilla and Aljur Abrenica’s recently concluded nuptials where Kylie’s candelabra decked entrance definitely reminded us of The Phantom of the Opera. As per Gideon’s Instagram post, though, both the ceremony and reception were actually inspired by the haunting sounds of Lana del Rey’s Young and Beautiful, and the tragic love story of Romeo and Juliet. “Using vivid shades and deep hues, the pitch is to have something ethereal, romantic, dark, eerily beautiful, yet elegant.” Gideon describes. This industrial-themed wedding is truly one-of-a-kind. We especially love the unique metal arches towering over the dinner tables like fancy bird cages. “We pieced things together; acquired the most perfect measurements; fabricated chairs, light fixtures and sofas from scratch,” Gideon explains on one of his IG posts. "The whole setting can't be described by mere words. Each nook and cranny showcased an industrialist flair but in a deeper level.” Check out more of the wedding below.